It is very easy to translate a game from one language to another. Go through this tutorial and see the steps you need to follow. Once you have completed all the steps you just have to save as “Submit to Review”. After our editor has reviewed and approved it, your game will appear in the selected language section on the site. For this tutorial we continue on from the previous tutorial “How to Create a New Game” and use your previously created draft of “Living Room, tutorial” as an example. As an example, we will show you how to translate a game from US English to Chinese/Mandarin. (1) Go to your previously created draft of “Living Room, tutorial”. 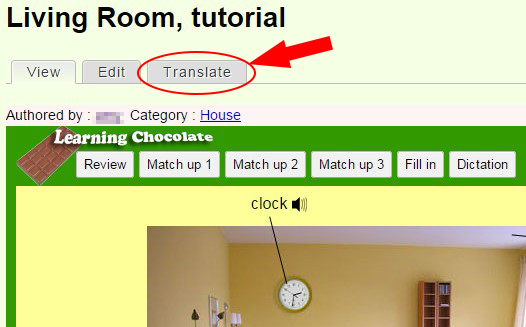 (2) Click the "Translate" tab under the title (see Figure 1). This will take you to the "Create Word Game" page. This page is very similar to what you saw in the previous tutorial. However, there are a few important differences: (i) The language, category, and cover image (thumbnail) are locked and cannot be changed; (ii) In your translation, you cannot add or delete any vocabulary, since the vocabulary is linked up to the original game. (4) Briefly check the language shows the correct one for your translation (in this tutorial, Chinese-Mandarin). However, you should not need to change it as it was selected in step 3 and should be locked here. (5) Change the title to the correct one for your translation. In this example, we change the title to “客厅(练习)”. (6) Now go to the content area. Click on vocabulary “ceiling”. Replace “天花板” in spelling field and add “tiān huā bǎn” in the phonetics field (see Figure 3a). The phonetics information is used mainly for the Asian languages which are harder to learn without it. (7) Select “Generated by machine” in the sound field and then click “Generate now” (Figure 3b). After the message “Generating sound …completed” is shown, click the sound button to hear and check the sound. (8) Repeat steps 6 and 7 for all other vocabulary terms within the game. The following table shows you the translation for the vocabulary in this game. Since the word lengths are changed, the vocabulary may overlap each other or go over the border now. 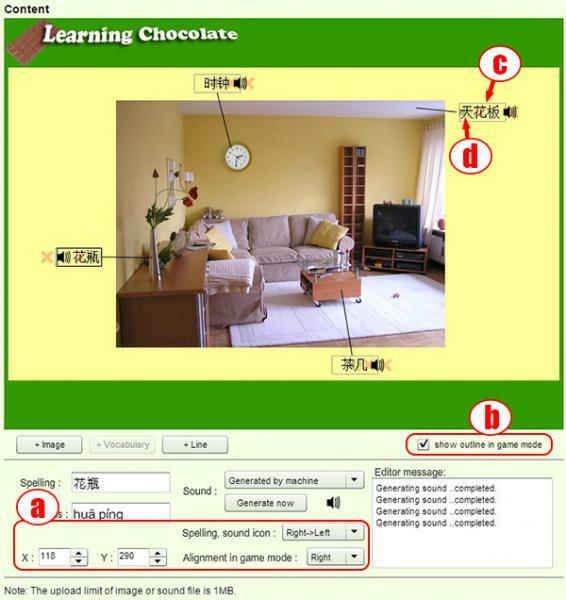 You may need to adjust the location, the spelling, sound icon arrangement, and the alignment in game mode (Figure 4a) of the vocabulary to make sure all the new words fit. In some cases, you may also need to adjust the locations of the pictures and lines to make it look better. And in some rare cases, you could also replace a more appropriate picture. (9) Check the “show outline in game mode” checkbox (Figure 4b). Observe if there is any overlap. Observe if the grey fill-in boxes (Figure 4c) are in a good location. Check that the grey sound buttons (Figure 4d) are in a good location and align with indication lines. Once everything is in the correct position, uncheck the “show outline in game mode” box. (10) Go to the Appendix box below the game. There is no Appendix for this tutorial game, so we don’t need to translate anything. However, if there is text for your game, please help to translate it for future users. If it is not related to the language you selected, you may just delete and leave it blank. (11) For the Category and Cover image setting, we would like to keep the original selections for the translated game to ensure consistency throughout the site. They are locked for this purpose so you do not need to change anything here. (12) Go to Status setting. We set to “Draft” for this tutorial. If you translate a real game, please select “Submit to Review”. 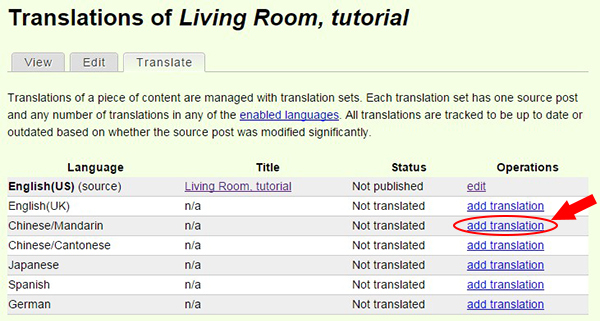 “Unlisted” is disabled for translated games. (13) Go to CAPTCHA. It is a verification code to determine if you are a human  and is used to avoid robot machine spamming this website. Just type the text you see in the image. (Some users who have contributed games before may not have to input the code again). (15) Since it is a newly translated game, we don’t need to click “Sync from source” button. There is a “Sync from source” button between Revision log message and the “Save” button which only appears when editing a translated game. Once you have translated a game, the author of the original game may change something. Pressing this button makes this translated game synchronize with the original game and the picture, the picture location, and lines. It can also remove the deleted vocabulary and add the extra vocabulary. All the translated words, phonetics, and sound will be kept, though. (16) Now all steps have been completed. Before saving, it is always best to preview the translation first. Click the “Preview” button. Check the spellings, try the pronunciations and play the games. Especially play match-up 2 and 3 games to see if the fill-in boxes or sound icons are displayed in good locations. If everything looks fine, click the “Save” button. Congratulations! You have finished this tutorial. We hope you enjoy translating a game by yourself! If you find any bugs, want to check anything or have any suggestions, please feel free to send us an email!